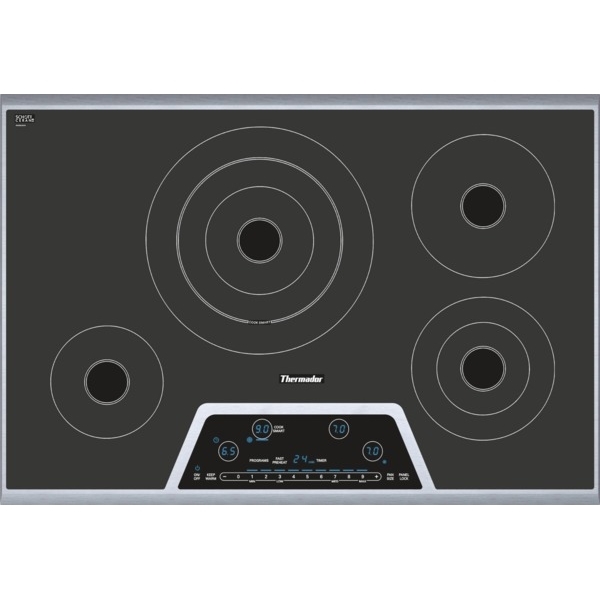 Thermador 30" Masterpiece series Electric Cooktop features CookSmart which comes with 9 pre-programmed cooking modes. Triple element offers the capability to use multiple pan sizes. Dual element offer the capability to use multiple pan sizes. Auto Shut Off Timer enables you to set the desired cooking time. Keep Warm function allows meals to remain ready to serve. Fast preheat mode accelerates the heating process for quicker results.Chilld Safety Lock. 2-level digital control panel indicates when elements are still hot. The design of this model is a Touch control panel with blue light illumination offers 17 power settings. A chiseled, angular design coordinates with the suite of Thermador Masterpiece Collection appliances, a full stainless steel frame and a trapezoid design control panel.